Karen Mullarkey - Just Move! Karen Mullarkey is five-foot-two, a former professional bodybuilder, and a bundle of vitality. It’s no surprise that she has become one of the best known and most respected personal trainers in the Phoenix area. In between helping clients meet their fitness goals, she’s working on one of her own: qualifying to take on the über-obstacle courses of NBC’s American Ninja Warrior, the national strength and speed competition that few women even attempt. While Karen attracts clients who want results and are willing to work for them, she’s also a believer in moderation. 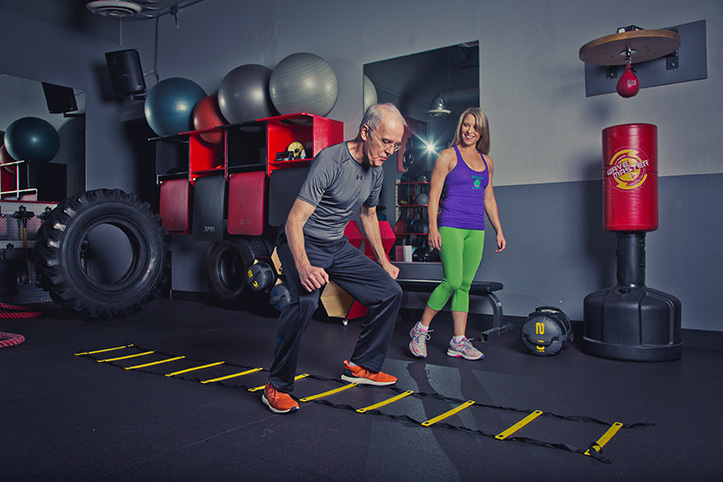 “As a longtime athlete, I’ve learned that more time in the gym isn’t necessarily better. Working out should never become obsessive,” she says. 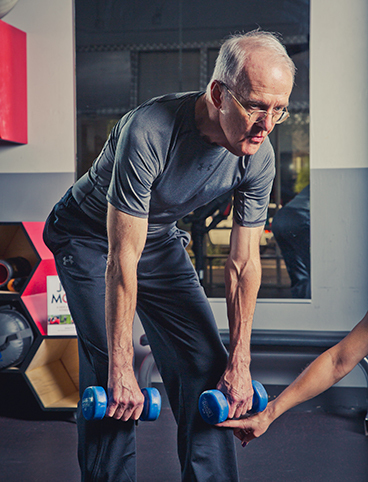 Her programs for older clients, especially those new to strength training, guide them through a series of initial stepping stones, with extra attention to movement form, balance and nutrition. “Many people, especially women, don’t eat enough protein. Getting the nutrition right is eighty percent of the battle,” she says. Karen makes a point of building conditioning exercises into strength training routines, and I knew my workout with her would be challenging. I told her I wanted a session that was also fun and different from my usual routines. She delivered on every score! Below are some highlights from our workout, with Karen’s commentary. Deadlifts are great for working your whole lower body, but you can really hurt your back if you don’t have good form. For one thing, you need to keep the weight close to your body. Side planks work your entire core, including the obliques, which are often overlooked in gym workouts. You can add challenge by lifting your top leg as you hold the position. Athletes use the agility ladder to hone their footwork; I like it because it improves reaction time. You jump inside the ladder with your feet together, and then jump with feet outside as you go into a squat, almost like hopscotch. I normally wouldn’t advise a 77-year-old to flip this tire – it’s 155 pounds – but of course Jim wanted to try. He’s very well conditioned, so I coached him on his form and he just did it! Hitting the tire with the sledgehammer is a full-body exercise that men, in particular, seem to enjoy. It feels like you’re out chopping wood! We started with the lightest hammer so Jim could get the correct form. Besides shoulders and abs, you use your legs to sit down into the movement. 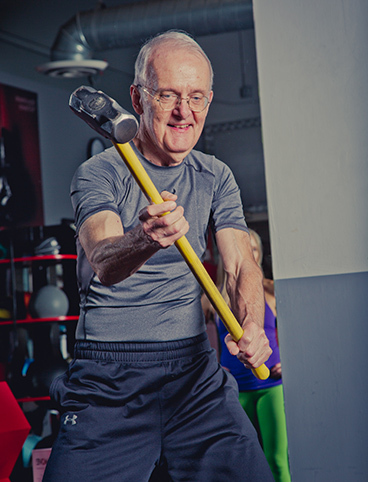 You also have to control the hammer so it doesn’t bounce back into your knees. 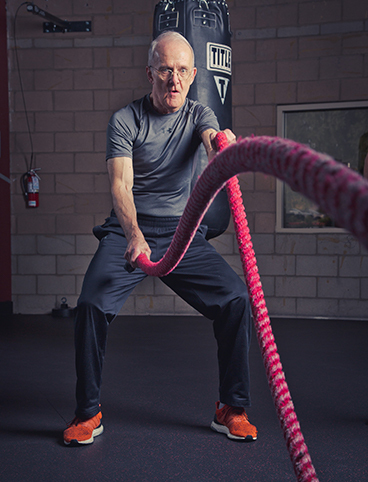 I often have my clients do battle ropes as a finisher. They’re good for whole-body conditioning, shoulders, legs, and cardiovascular, too. You want to be in a sitting position like Jim is here. I like doing twenty seconds of work, then ten seconds of recovery. Then you can really sit back into them.